To articulate citizen movements around a free, public and common platform to map and act together to promote the commons. IN COMMON is a cooperative data library where civil society and solidary economy actors can share, view, and map their data. IN COMMON is also a community whose members meet regularly. 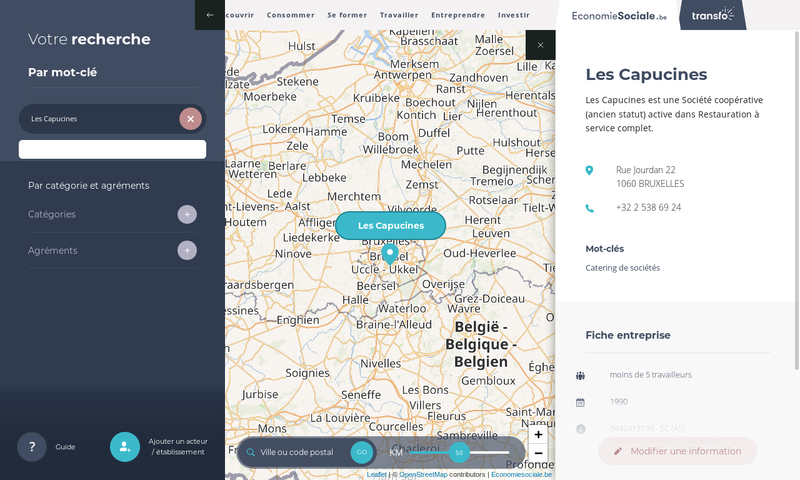 Every first Friday of the month, starting in March 2019, our collective will organize hands-on carto' workshops for members and the public. IN COMMON started in 2017 with strong support from the Belgian associative sector (Dewey, Petites Singularités, Réseau Transition, Mycelium, Agroecology in Action). in 2018, the project received institutional support from the Région Wallone. Today, IN COMMON is a partner of Co-create Innoviris 'Mutualisons' project. These five objectives match the 5 fundamental principles of the IN COMMON Charter. 2015 was a great year for citizen cartography (like maps.dewey.be), inviting 'citizens collectives' and other civil society actors to document their own actions: who are they? What are they doing? How do they operate? But there was an issue: these tools were often developed separately, and sometimes were competing with each other. Following a meeting organized by Réseau Transition in 2016, several associative actors engaged in a process of sharing cartographic data. This was the starting point for IN COMMON, a system that would enable civil society actors to mutualize their data management. This is how IN COMMON was born. The first project partners are Dewey, Petites Singularités, Réseau Transition, Mycelium, Agroecology in Action. Several months later, at the end of 2018, the technical fundamentals of the public API are ready. Remains to be done the user interface. maps.dewey.be is one of the initiatives at the origin of IN COMMON. The map of solidary economy by ConcertES was finalized in December 2018. WHY POOL DATA IN COMMON? Simply, we want to take back control of our information and communication. It's no secret to anyone that the champions of data theft and fiscal evasion (the GMAFIA) imposed their services as almost inevitable 'public places', from our smallest daily moves to the largest social movements of our times. Using them means to enclose yourself inside an information bubble without any agency. Not using them means to defect from these large gathering and mobilization places. What to do then? IN COMMON belongs to these digital initiatives (like Mastodon, Framasoft, etc.) proposing alternatives to the GMAFIA: we provide a data commons and an API with which citizens and actors of the solidary economy can share, view, and map their local realities. IN COMMON is also an active community whose members gather regularly to identify, promote, and defend the commons. HOW DOES IN COMMON WORK? Database maintenance is a long and tedious work. With IN COMMON, a network of associations and social enterprises are researching ways to mutualize this work, so as to co-manage their data sets through a unique data library. Technically, this 'data library' provides an API written in Ruby on Rails and available via simple HTTPS requests: a normalized ensemble of classes, methods and functions that allows offering services to other software. In our case, it enables various users to put their public data in common, to share and manage the maintenance work for these data. Are you willing to view or amend the common data library? Consuming the API and using the public maps is entirely public! No need to register — or be tracked. If you want to participate and amend or create new data, it's as simple as joining the ongoing conversation and to sign the IN COMMON Charter. You're welcome to visit our carto workshops. This data library was conceived by and for civil society: hence it inevitably reflects fundamental principles of the associative and cooperative world, as well as this of the social & solidary economy: common good, democratic management, management autonomy, primacy of labour over capital. You can visualize common data with a map (we can print thematic maps). 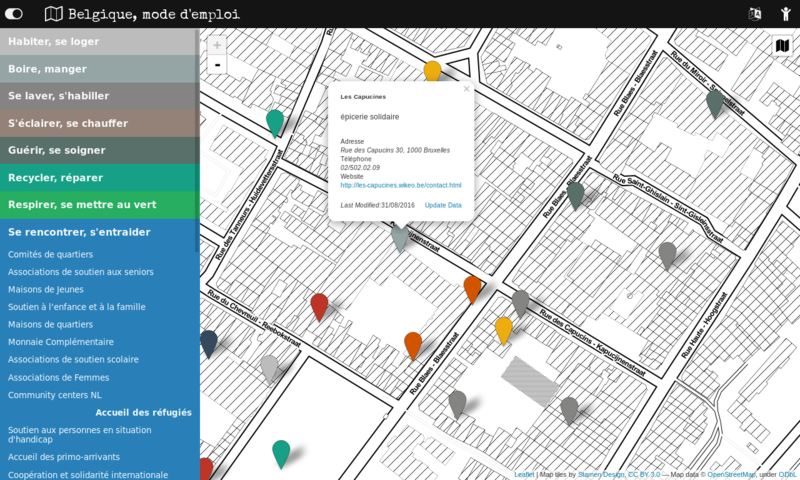 Starting in March 2019, IN COMMON will organize monthly carto' workshops — on each month's first Friday afternoons — around a specific theme (e.g., housing, health, mobility…). We'll learn how to create maps using IN COMMON and QGIS. Are you willing to create a map related to your activity? Register to the carto' workshops. Each session will focus on one theme and will last about 5 hours (from 13:00 to 18:00): we'll learn how to get started with QGIS, then proceed to hands-on practice from IN COMMON data sets.